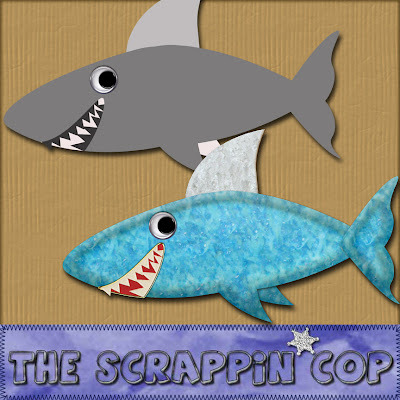 The Scrappin Cop: CU Shark layered template! As promised, here's the second post of the night, a shark layered template. I think this will do it for Ocean Pals. Now I need to figure out what to do next! LOL. I always have a bunch of ideas, but getting them from my brain to CS3 is sometimes the problem! I bought a "Bowdabra" the other day and planned to make some bows to photograph but it doesn't seem to work as well as the picture on the box! I just need some practice I guess. Anyway, here's the shark and unless there are any more requests this will be the last Ocean Pal. Thanks for another great template! And also for those frayed brushes - can't wait to try them out. Thank you so much for sharing your templates. They are great!!! thank you for another great template. i've tried one of them and they are so much fun. Here is my devotion and undying love. I am so happy to have found you and your stuff. I may actually learn how to use the new software with your guidance and inspiration. Keep on letting me know while you learn. I feel like I am learning with you. Yay me! Yay you! Thank you so much. I can't wait for a chance to sit and play with all these new goodies. I love your shark's toothy grin! Thanks for all your wonderful creations! This shark is 2 cute!Love the grin. Thanks for all the great ocean pals templates. I always look forward to visting your blog. Thanks for sharing your talents with all of us. Thanks so much for sharing all your creations with us. It's nice to see that us non PS users can use these. I can't wait to play. Thank you, he is the cutest!! love your blog and your designs are unusual and really great! HA! LOVE IT! That google eye and the teeth are great! Wow Deb - I'm loving this series! My daughter has an "ocean" of Bath toys so these are perfect! I love the ocean pals! Thank you.